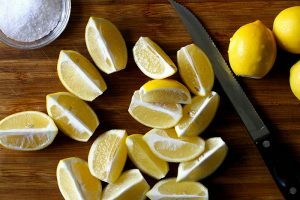 Justin Chapple of Food & Wine magazine taught me how to make speedy Preserved Lemons. In his book Just Cook It!, Justin says cut 4 Meyer lemons into 6 wedges. Put them in a saucepan with 3 tablespoons of Kosher salt and 2 cups of water. Bring them to a boil over high heat, then simmer on medium about 10 minutes until they’re very tender. Put them in a lidded jar with the cooking liquid and you can use them right away. They last in the fridge for six months. Great in fish, chicken, sandwiches, pasta, and grilled lamb.